Essentially all metals can be recycled, and aluminum is certainly no exception to this. In fact, aluminum is one of the most recycled materials in the entire world. Unlike some other metals, when aluminum is recycled, it loses absolutely none of its quality. 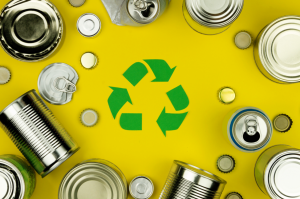 This means that, as long as it’s put through the recycling process, aluminum can be used over and over again. Want to learn more about aluminum recycling in Elk Grove Village? Keep on reading. This article has you covered. As you might already know, soda cans are made out of aluminum. While you probably won’t get a huge monetary return for recycling them, you can make a little spending cash. Maybe you just got done remodeling your home, and have an old aluminum sink sitting in storage? If so, you should consider recycling it. Depending on the size of the sink, you could make a decent chunk of change by handing it over to a recycling company. Most everyone has some old athletic equipment, from baseball bats, to golf clubs, and much, much more. All of this gear can be recycled. Have you recently swapped out an old fence for a new one? Was your old fence made out of aluminum? If so, depending on its condition, you can recycle it. There is a wide variety of aluminum furniture in circulation, from chairs, to tables, and everything in between. All of this furniture can be recycled. There is no shortage of benefits which come from recycling aluminum. In general, these benefits fit into two categories: environmental benefits and economic benefits. The most obvious benefits of aluminum recycling are environmental. The simple fact of the matter is that the recycling of aluminum lessens the overall environmental impact of producing brand new aluminum. First, it should be noted that recycling aluminum requires a great deal less energy than mining fresh aluminum. Because less energy is being utilized, a smaller carbon footprint is being made. This smaller carbon footprint means a reduction in greenhouse gas emissions, which means that a great deal of strain is being taken off of the earth’s atmosphere. In addition to this, aluminum recycling preserves the earth’s natural aluminum mines. The less we mine fresh aluminum, the longer we can use it into the future. It’s simple: when we recycle aluminum, we drive down the prices of aluminum goods. This is due to the fact that, by recycling it, aluminum is allowed to remain plentiful, and doesn’t turn into a rare metal. However, this is not the only way in which aluminum recycling benefits the economy. Aluminum recycling also benefits the economy by creating jobs. Hundreds of thousands of jobs in the United States are based in metal recycling. By recycling aluminum, we ensure that these jobs remain. Have Aluminum to Recycle in Elk Grove Village? Are you in possession of aluminum items? Interested in recycling them? Looking for an aluminum recycling company in Elk Grove Village? Central Metal Recycling is the company you seek. Regardless of the volume of the aluminum that you have in your possession, we would be happy to take it off your hands. We always pay top dollar.